David Melvin Jontz was born October 5, 1940 at California Hospital in Los Angeles to Melvin Jontz of Ohio and Christine MacKay of Scotland. He had one sister, Judith 'Judy Jontz Morris (1945-1999), SPHS Class of '63. At the age of eight, Jontz joined the Boys' Choir at the Episcopal Cathedral of Los Angeles and began a lifelong love of music. He was also an accomplished pianist. He graduated from South Pasadena High School in 1958 and attended Pasadena City College for two years. He enlisted in the US Navy in 1960, where he served for the next seven years. He spent time on the USNS Muller, in the Caribbean on an aircraft carrier during the Bay of Pigs, and at the Edzell Royal Air Force Base in Edzell, Angus, Scotland. He worked in high security as a "listener" working with top secrets. During his 2 1/2 years of service in Scotland, he was able to spend time with his mother's cousins and became acquainted with his Scottish roots. After the Navy, David worked with his father at the Melvin Jontz Co in South Pasadena, selling manufacturing medium. He returned to school to complete his Bachelors at Cal State LA. He later received his Masters degree as a computer systems analyst and found work in the banking industry. 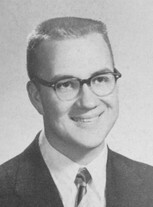 David first met Carolyn in 1965, while visiting his sister Judy at William Penn College in Oskaloosa, Iowa. They continued a long distance friendship and courtship before getting married in Long Beach in 1970. David and Carolyn had James in 1974 and Kevin in 1978. They enjoyed summer trips vacationing throughout the western United States, cruises to Alaska and through the Panama Canal, and visiting family in Iowa. David visited all 50 states and he was a train and trolley fanatic. Often vacations would center on a train ride like the Durango Silverton trip in Colorado. David gave back to many organizations in South Pasadena; Cub Scouts as the Cub Master of Pack 7 and Boy Scouts as the Scout Master of Troop 342. He joined the Kiwanis Club after completing his Navy service and has spent over 45 years as an active Kiwanian, participating in fundraising and service events like the annual South Pasadena 4th of July Pancake Breakfast. He also often volunteered at local events for South Pasadena Tournament of Roses fundraisers. He was an active member of Calvary Presbyterian Church for 40 years and served multiple terms as an Elder with the church. He sang as a member of the Chancel Choir and looked forward to singing the Messiah every holiday season. David spent more than 26 years in South Pasadena High School on the Bingo Committee as a bingo caller. He spent the last two years as the President and a caller. David passed away November 11, 2014, he is survived by his wife Carolyn, sons James (SPHS '92 and Kevin (SPHS '97), daughter-in-law Amelia, and nephews Stephen, Ian, and Bradford Morris. David was also a member of the South Pasadena Chapter of the Order of DeMolay. In school, he will be remembered by his classmates for his red Jeep and taking pictures for The Tiger newspaper. David was probably one of my closest friends. I will miss him very much.